The Midwest Region includes parts of Illinois, Indiana, Kentucky, Michigan and Wisconsin. The purposes of the Region are to promote, stimulate, foster, and encourage by all manner and means the art and craft of model railroading and the preservation of the hobby’s history, science, and technology. The Region accomplishes its purposes through its Divisions, publishing the Waybill (a quarterly newsletter), holding Conventions and by promoting the NMRA Achievement Program. Meetings consist of open discussion followed by a program designed to assist model railroaders in becoming better modelers, layout builders, and operators. The programs range from hands-on workshops on weathering, painting, installing DCC, programming decoders, creating backdrops, model photography, etc. to clinics put on by some of the hobby’s best model railroaders. 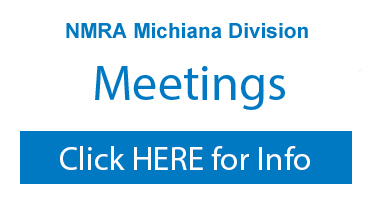 Like all NMRA division activities around the world, all Michiana Division meetings and other activities are open to all NMRA members, regardless of where the member’s “home” region and division may be. Guests and visitors are welcome for up to three meetings before joining the NMRA.. The Michiana Division is the birthplace of the NMRA EduTRAIN training program. EduTRAIN is based on a methodology for developing courses (clinics) based on many years of experience in government, industry, the military and education that is proven to facilitate the transfer of knowledge and skills. This methodology will provide higher quality and greater consistency for all clinics included in the NMRA EduTRAIN® brand. In addition to scheduled meetings, the NMRA Michiana Division also hosts regular model railroad operating sessions at members’ home layouts. We host “photo safaris” where division members go on trips around the area to photograph railroad equipment, structures (particularly older structures), and infrastructure, along with modelable scenes. Many of our members have an interest in building Freemo modules so that they can run them at our annual Education and Training Conference and Workshops. The NMRA Michiana Division Counties include: Berrien and Cass in southwestern Michigan and Lake, Porter, LaPorte, St. Joseph, Elkhart, Stark, Marshall, Newton, Jasper, Pulaski, and Fulton in northwestern Indiana.